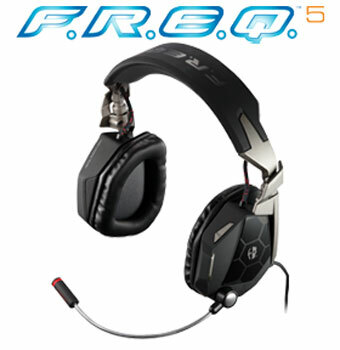 Put the game on your ears with Mad Catz' F.R.E.Q.5 Stereo Gaming Headset for PC and Mac. With premium-quality 50mm drivers, intuitively placed on-ear controls, and a detachable noise-canceling microphone, F.R.E.Q.5 stereo headphones keep your gaming sessions well-equipped for extended listening comfort. Housing oversize speakers which pump out robust stereo sound with a wide dynamic range, the comfortable, spacious earcups provide clean and clear audio reproduction. Previously hidden details in your game's audio soundscape will enrich your immersion and enhance your gameplay like never before. The skillfully engineered earcup design also helps block out distractions like excessive teammate chatter so you can focus on playing at your best. Utilizing the highest quality drivers available for use in commercial headsets – neodymium – F.R.E.Q.5 stereo headphones feeds high-fidelity audio through a pair of amplified 50mm speakers for deep bass and crisp undistorted highs. Built to the same exacting standards as the award-winning Mad Catz R.A.T. and constructed to survive the stress of LAN tournaments, F.R.E.Q.5 stereo headphones mix comfort with sturdiness to accommodate extended gaming sessions. Lightweight metal components provide ample adjustability to give you a customized fit - - and the cans even fold flat to support an around-the-neck resting position - - all while bringing a level of durability previously unheard of in PC gaming headsets. When not using to the mic to communicate with your online teammates, a headset's microphone only gets in the way. Problem solved with the Mad Catz F.R.E.Q. 5's removable solution - - it provides the freedom to use the mic only when necessary. And when gaming in loud environments, advanced noise cancelation stifles ambient sounds to ensure your conversations are crystal-clear. Toggling the microphone mute button prevents your teammates from hearing anything you don't want them to, and red LED illumination in the tip of the detachable mic will never make you wonder whether or not they can hear you. Intuitive placement of all controls provides simple adjustability without the need to remove the headset. Mute the mic, tweak the volume, and toggle equalizer settings all while keeping your eyes on your monitor. Use the headset's handy quick-release connector to instantly gain MP3 player compatibility and convert the Mad Catz F.R.E.Q. 5 into portable headphones. Just swap out its USB cord for the included 3.5mm audio cable and then plug directly into your device. And if you have a smartphone*, you can even take voice calls using the microphone. * Supports Apple iPhone, BlackBerry, and HTC handsets.